In 2017 Amazon’s US market share of smart speakers (was) between 70% and 76%. (But) a recent study found Alexa is significantly worse than Google Assistant at answering questions and executing commands. The quiz tested their abilities to respond to both informational and action-based queries. In every category, Google Assistant bested Alexa—in some cases, by as much as a factor of five. Three years and change since Amazon first launched Alexa, the digital assistant has become a familiar voice in American homes. According to estimates by the online publication Voicebot.ai, Amazon had sold over 20 million Echo units (featuring Alexa) by October of last year—and this was before Black Friday and the holiday season. Three separate reports in 2017 placed Amazon’s US market share of smart speakers between 70% and 76%. In contrast, Google, which launched its Home product (featuring Google Assistant) in Nov. 2016—Echo was made available to the public in June 2015—only captures between 15% and 24%, according to those same reports. The preference Americans have shown for Alexa over Google Assistant isn’t founded in the products’ respective technical performances, however. 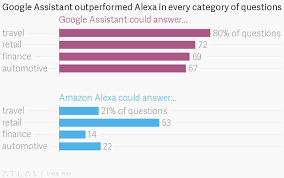 A recent study conducted by 360i, a New York-based digital marketing firm, found Alexa is significantly worse than Google Assistant at answering questions and executing commands across various topics. 360i used proprietary software to quiz Google Assistant and Amazon Alexa on their ability to respond to the same set of queries across four categories: 5,000 in travel, 5,000 in retail, 3,000 in finance, and 3,000 in automotive. The quiz tested their abilities to respond to both informational (“Where’s a good place to go hiking?”) and action-based (“Buy hiking boots.”) queries. In every category, Google Assistant bested Alexa—in some cases, by as much as a factor of five. Additionally, he speculates, the Echo does a great job of meeting “the basic functionalities that people definitely expected from” the first-ever smart speaker, like being able to play music and set reminders. Even though Google Assistant’s access to Google’s search indexing gives it an advantage in answering a wider breadth of queries, “that doesn’t necessarily mean that people are asking those questions as of yet,” Dobbs says. In other words, Google Assistant’s smarts may extend beyond what consumers are currently looking for, leaving little reason for current Echo owners to switch, or for those looking to buy their first smart speaker to choose a slightly more expensive option over the other. (Google Home costs $129 at Best Buy, whereas Amazon’s 2nd generation Echo costs $99 on Amazon.) This is in line with the findings of an Oct. 2017 study that found the majority of smart-speaker owners use the devices for tasks that don’t require much intelligence. In the future, however, Dobbs thinks Amazon’s first-to-market advantage will fade and the gap between the Echo and Google Home will close. In part, this is because consumers will continue to demand broader types of information from their smart assistants, he says, which will play into Google Home’s strengths and help it gain market share. But rather than overtake Amazon Echo on the market, Dobbs predicts, Google Home and Echo will eventually reach share parity, because both smart speakers’ capabilities will slowly converge. Whereas Amazon is looking “to figure out how they can answer more informational types of questions” to catch up to Google, Google is building out partnerships “with big brands like Target and Wal-Mart to help answer more retail-based questions” and keep up with Amazon, he says. It’ll only be a matter of time—”determined particularly on how fast both of the companies tap into different data sources” to mimic the capabilities of their competition, says Dobbs—before the Echo and Home will become indistinguishable.